Invisalign clear plastic aligners work by making use of 3-D imaging technology to help plan out a comprehensive treatment plan that is unique to each patient. Each individual plan will show the initial position of your teeth and then go through the following stages of your orthodontic treatment. Each stage will show the progress that the aligners should make in realigning your teeth, so you know what to expect throughout the entire treatment process. Once Dr. Beck has created a treatment plan, your treatment can begin immediately. 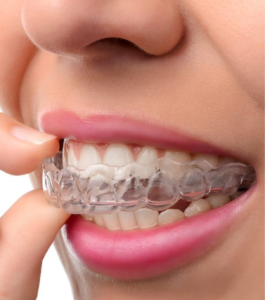 Invisalign liners that are made of strong, clear plastic to provide almost invisible guidance for your teeth. You wear each “stage” for about three to four weeks before swapping it out for the next aligner in your treatment plan. This process continues until the end of your treatment, once your teeth are in their new, more fabulous position. Discreet treatment. With Invisalign’s clear plastic aligners, patients can avoid the “metal mouth” that many adults would rather avoid while undergoing orthodontic treatment. Invisalign aligners blend seamlessly into the natural color and complexion of your smile so that most people will never know you’re even undergoing treatment. Improved comfort. No metal brackets or wires means not having the delicate tissue in your mouth poked and pinched by your orthodontic appliance. Invisalign aligners are custom-made to precisely fit your teeth so that they always remain comfortable and easy to wear. Fewer office visits. No brackets or wires also means not needing to make monthly visits to see your orthodontist to have your appliance readjusted or repaired. By following the treatment plan created by Dr. Beck, patients only need to make periodic visits to ensure their treatment remains on track. Eat what you want. With Invisalign, you can drink and eat whatever you want. You no longer have to avoid sticky or hard foods that could cling to your braces or break your orthodontic appliance because the aligners are removed and then replaced when you are finished eating. Brush and floss like normal. No brackets or wires also mean you can also floss and brush as you normally would. No need to use specially designed flossers or toothbrushes that allow you to clean around your braces. Call us today with any questions or to schedule an appointment!